While the mainstream media is busy making a mockery of itself with runaway hysteria "witch hunt" hate speech against parents who choose not to poison their children with toxic vaccines, the real story on the measles outbreak remains entirely unreported in any mainstream media outlet. The true story about how Big Pharma's own vaccine scientists blew the whistle on MMR vaccine research fraud taking place over a decade ago, warning that the vaccine's approval by the FDA was based on "falsified results" and that the fraudulent MMR vaccine was the "primary cause" of a measles outbreak in 2006, as they state in their own words (see below). The senior management of the world's top vaccine producer was actively engaged in the fraud, according to the whistleblowers, even going so far as to test the vaccine against contrived "laboratory" strains of infectious viruses rather than testing them against strains circulating in the real world. This created an MMR vaccine with results that could be faked to appear effective while actually conferring almost no real-world protection at all, thereby ensuring an eventual outbreak that the media would seize upon to call for more vaccines. When these pro-vaccine scientists attempted to sound the alarm on the MMR vaccine research fraud they not only witnessed but actually took part in carrying out, they were threatened with being arrested and sent to prison, according to their own testimony. The sellout mainstream media, not surprisingly, refuses to cover this story in exactly the same way it refused to cover the public confession of the CDC whistleblower scientist who went public with his own allegations of vaccine research fraud at the CDC. 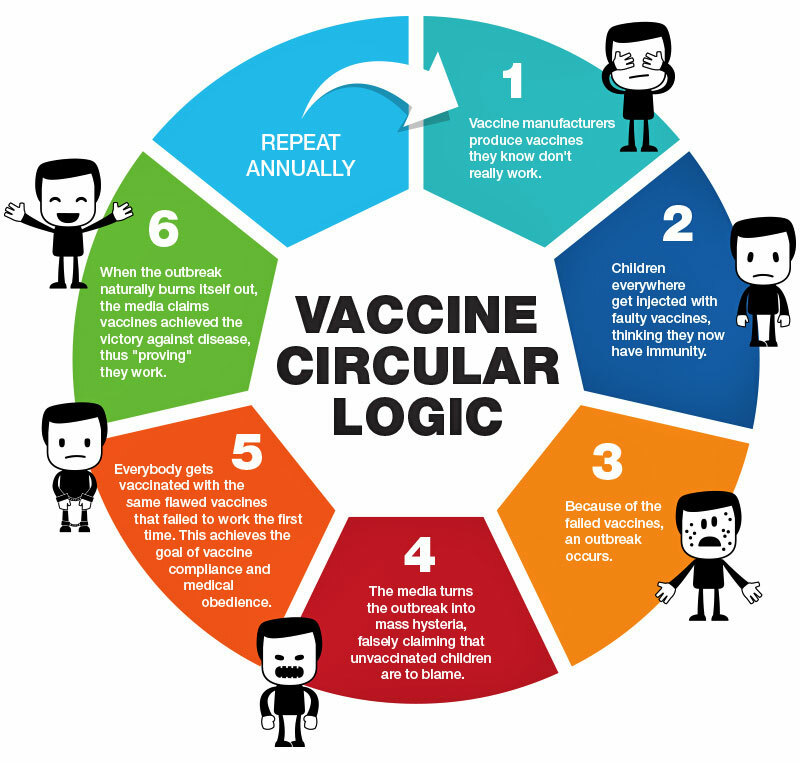 Any time you see a mainstream media news report on vaccines, you can rest assured with 100% confidence that it is pure theater, carried out with carefully scripted fake narratives to achieve a propaganda goal of demanding complete obedience to all demands of the vaccine industry. Media outlets now function as nothing more than propaganda pushers for the medical fascism police state which has descended upon America. We now have new transcriptions from this document filed with the United States government, which reveals shocking details about the vaccine fraud witnessed firsthand by Big Pharma's own scientists. 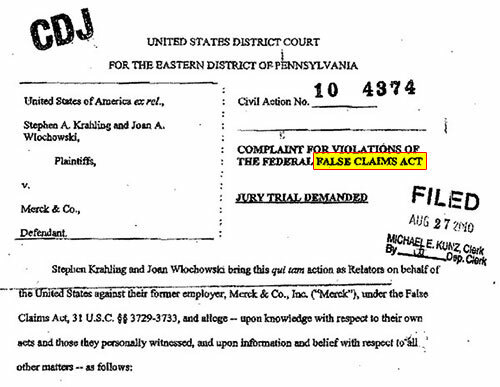 The document is entitled "United States District Court for the Eastern District of Pennsylvania. Civil action No. 10-4374 - Complaint for Violations of the Federal False Claims Act." This case is about Merck's efforts for more than a decade to defraud the United States with respect to the efficacy of Merck's mumps vaccine. The FDA insists on such a high efficacy rate (95%) because only then can the disease ultimately be eradicated through what is commonly referred to as "herd immunity." Relators Krahling and Wlochowski participated on the team that conducted this supposedly enhanced test. Each of them witnessed firsthand the falsification of the test data in which Merck engaged to reach its 95% efficacy threshold. In fact, each was significantly pressured by Krah and other senior Merck personnel to "participate in this fraud." Merck added rabbit antibodies for the singular purpose of altering the outcome of the test by increasing the virus neutralization count. Without applying a proper "control" to the process, there is no way to isolate whether virus neutralization is caused by the human antibodies alone or in combination with the rabbit's antibodies, Merck did not apply this kind of control. Krah did not act alone in orchestrating the falsification of Merck's mumps vaccine test results. He acted with the authority and approval of Merck's senior management. In July, Relator Krahling met with Alan Shaw, Merck's Executive Director of Vaccine Research and complained to him about the fraudulent vaccine testing. Relator Krahling then met with Bob Suter, Krahling's human resources representative at Merck. Krahling told Suter about the falsification of testing data and Shaw's refusal to get involved. Krahling told Suter that he was going to report the activity to the FDA. Suter told him he would go to jail if he contacted the FDA and offered to set up a private meeting with Emini where Krahling could discuss his concerns. Emini agreed that Krah had misrepresented the data. Krahling also complained about the use of rabbit antibodies to inflate the seroconversion rate. Emini responded that the rabbit antibodies were necessary for Merck to achieve the project's objective. The next morning, Krah arrived early to the lab and packaged up and destroyed evidence of the ongoing Protocol 007 efficacy testing. This included garbage bags full of the experimental plates that would have (and should have) been maintained for review until the testing was complete and final. Despite the threats he received from Suter and Emini, Krahling called the FDA to report this activity and Merck's ongoing fraud. On August 6, 2001, in response to Krahling's call, an FDA agent came to Merck to question Krah and Shaw... And she did not address the actual destruction of evidence that Krah had already facilitated. "Wide-scale falsification of test data"
What no one knew outside of Merck - not the FDA, the CDC or any other governmental agency - was that this result was the product of Merck's improper use of rabbit antibodies and the wide-scale falsification of test data to conceal the inflated seroconversion numbers these antibodies generated. Around the same time, the EMA also approved Sanofi Pasteur MSD's application for sale of Merck's ProQuad in Europe. As with MMRVaxPro, Merck's joint venture submitted the falsified results of Protocol 007 to the EMA as supportive clinical information in its vaccine application. "Flawed vaccine is the primary cause of the outbreaks"
The reason for these continued outbreaks is that Merck's vaccine docs not have a 95 percent efficacy rate. Without demonstrating that its mumps vaccine continued to be 95 percent effective, Merck would lose its exclusive license to manufacture and sell its MMRII vaccine. And if Merck lost the license for MMRII, Merck would also be unable to secure FDA approval for its ProQuad vaccine. So, Merck set out to conduct testing of its mumps vaccine that would guarantee an efficacy rate of 95 percent or higher. It did this through manipulating its testing procedures and falsifying the test results. Relators Krahling and Wlochowski participated on the Merck team that conducted this testing and witnessed firsthand the fraud in which Merck engaged to reach its desired results. Merck internally referred to the testing as Protocol 007. 25. While Merck's PRN test was modeled after the efficacy test generally accepted in the industry, it diverged from this "gold standard" test in a significant way. It did not test the vaccine for its ability to protect against a "wild-type" mumps virus. A wild-type virus is a strain of the virus as it exists in nature and would confront a person in the real world. That is the type of real-life virus against which vaccines are generally tested. Instead, Merck tested the children's blood for its capacity to neutralise the same Jeryl Lynn mumps strain with which the children were vaccinated. The children's vaccine response was not tested for its capacity to neutralize virulent, disease-causing mumps virus. The use of the Jeryl Lynn strain, as opposed to a virulent wild-type strain, subverted the fundamental purpose of the PRN test which was to measure the vaccine's ability to provide protection against a disease-causing mumps virus that a child would actually face in real life. The end result of this deviation from foe accepted PRN gold standard test was that Merck's test overstated thee vaccine's effectiveness. "Falsification of the test data"
The second test Merck employed under Protocol 007 was formally called the Anti-IgQ Enhanced Mumps Plaque Reduction Neutralization Assay. It was commenced in 2000 and again led by Krah and hia staff at Merck's West Point facility. Relators Krahling and Wlochowski participated on the team that conducted this supposedly enhanced test. Each of them witnessed firsthand the falsification of the test data in which Merck engaged to reach its 95 percent efficacy threshold. In fact, each was significantly pressured by Krah and other senior Merck personnel to participate in this fraud. But the use of the rabbit antibodies allowed Merck to achieve its high seroconversion objectives. In fact, the exact same paired blood samples that were found under Merck's original PRN test to lack sufficient virus neutralizing antibodies were now considered seroconverted under the "enhanced" test. Indeed, in one panel of sixty paired blood samples that had failed the original PRN test, Merck measured a seroconversion rate of 100 percent! ln other words, non-neutralizing concentrations of antibodies that would never protect a child from mumps in the real world were under Merck's "enhanced" test treated as vaccine successful solely because of the additional neutralization provided by the rabbit antibodies. Specifically, Krah and Yagodich and other members of Krah's staff falsified the test results to ensure a pre-positive neutralization rate of below 10 percent. They did this by fabricating their plaque counts on the pre-vaccination blood samples, counting plaques that were not actually there. With these inflated plaque counts, Merck was able to count as pre-negative those blood samples that would have otherwise been counted as pre-positive because of the increased neutralization caused by the rabbit antibodies. "Falsification [was] broad-based and systematic..."
Krah and Yagodicii falsified plaque counts to convert pre-positives to pre-negatives, and directed other staff scientists to do the same. Krah appointed Yagodich and two others to "audit" the testing that other staff scientists had performed. These audits were limited to finding additional plaques on pre-positive samples thereby rendering them pre-negatives. Krah instituted several measures to isolate the pre-positive samples, facilitate their "re-count" and consequent conversion to pro-negatives, and minimize the chances of detection. Those included destroying test results, substituting original counting sheets with "clean" sheets, and entering and changing test results directly onto electronic (excel) spreadsheets that left no paper trail. Merck cancelled a planned outsource of the efficacy testing to a lab in Ohio because the outside lab was unable to replicate the seroconversion results Krah was obtaining in his lab. Krah and his staff conducted all the testing instead. Unsurprisingly, none of the "recounting" and "retesting" that Merck performed as part of its "enhanced' PRN testing was performed on any post-vaccination samples or on any pro-vaccination samples that were pre-negative. This additional "rigor" was only applied to the pre-positive samples, the very samples that were keeping Merck from achieving the requisite 95 percent seroconversion threshold. In July 2001, Relators Krahling and Wlochowski conducted their own test to confirm statistically what they already knew to be true. They reviewed approximately 20 percent of the data that Merck had collected as part of the "enhanced" PRN test. In this sampling, they found that 45 percent of the pre-positive data had been altered to make it pre-negative. No pre-negatives were changed to pre-positives. No post-positives were changed to post-negatives. No post-negatives were changed to post-positives. All changes were in one direction - reducing the incidence of pre-positives. The statistical probability of so many innocent changes occurring in just the pre-positive data and in no other data was more than a trillion to one. And that is a conservative measure given the likelihood that an even greater number of pre-positives were changed but remained undetected because the changes were not recorded in Merck's files. In April 2001, for example, Emilio Emini, the Vice President of Merck's Vaccine Research Division, held a meeting with Krah and his staff where he directed them to follow Krah's orders to ensure the "enhanced" PRN testing would be successful. Krah's orders to ensure the "enhanced" PRN testing would be successful. He also told the staff that they had earned very large bonuses for their work so far on the project and that he was going to double the bonuses mid pay them once the testing was complete. In July 2001, Relator Krahling met with Alan Shaw, Merck's Executive Director of Vaccine Research, and complained to him about the fraudulent vaccine testing. Krahling presumed that Shaw already knew about the fraud since he visited Krah's lab frequently and almost certainly would have witnessed the changing of pre-positive data that Krah was openly directing. Nevertheless, Krahling wanted to put Shaw on formal notice of the fraud end told him of the falsification of the pre-positive data. He also complained about the improper use of the rabbit antibodies to inflate the post-vaccine neutralization counts. Shaw responded that the FDA permitted the use of rabbit antibodies and that that should be good enough for Krahling. Shaw refused to discuss anything further about the matter. Instead, Shaw talked about the significant bonuses that Emini had promised to pay once the testing was complete. Relator Krahling then met with Bob Suter, Krahling's human resources representative at Merck. Krahling told Suter about the falsification of testing data and Shaw's refusal to get involved. Krahling told Suter that he was going to report the activity to the FDA. Suter told him he would go to jail if he contacted the FDA and offered to set up a private meeting with Emini where Krahling could discuss his concerns. Shortly thereafter, Emini agreed to meet with Krahling. Krahling brought to the meeting actual testing samples and plaque counting sheets to demonstrate to Emini the fraudulent testing that Krah waa directing. Emini agreed that Krah had misrepresented the data. Krahliug also complained about the use of rabbit antibodies to inflate the seroconversion rate. Emini responded that the rabbit antibodies were necessary for Merck to achieve the project's objective. Krahling proposed a scientific solution to lower the pre-positive rate and end the need to falsify data - stop using rabbit antibodies. When Emini declined, Krahling asked him what scientific rationale justified using the rabbit antibodies. Rraini explained that Merck's choice to use these antibodies was a "business decision." The next morning, Krah arrived early to the lab and packed up and destroyed evidence of the ongoing Protocol 007 efficacy testing. This included garbage bags full of the experimental plates that would have (and should have) been maintained for review until the testing was complete and final. "FDA overlooked the vaccine fraud"
The FDA issued a one page deficiency report identifying a few relatively minor shortcomings in Merck's testing process. These principally related to flaws in Merck's record-keeping and in its validation/explanation of changes to the test data. The report did not address nor censure Merck for any issues relating to Merck's improper use of rabbit antibodies or Merck's wide-scale falsification of pre-positive test data. The FDA did not discover this fraudulent activity in the course of their perfunctory visit because of Krah's and Shaw's misrepresentations to the FDA. In order to comply with the deficiency report, Merck made minor adjustments to its testing procedure relating to its heretofore ad hoc procedure for counting plaques. "Wide-scale falsification of [vaccine] test data"
Merck completed its Project 007 testing in late summer or early fall 2001. Unsurprisingly, the results Merck reported fell within the 95 percent seroconversion target Merck had from the outset. This is the result Merck provided the FDA and the public at large.